In physical cosmology, dark energy is a hypothetical form of energy that permeates all of space and tends to increase the rate of expansion of the universe. It is called "dark" because it has no electric charge and does not interact with electromagnetic radiation, such as light. All these components of the universe have positive mass/energy. They have an attractive gravitational interaction and are slowing down the expansion of the universe. The putative dark energy, however, has a negative mass/energy and a repelling gravitational interaction. The effect of dark energy is opposite to the positive energy components: It is speeding up the expansion of the universe. Postulating the existence of dark energy is the most popular way to explain recent observations that the universe appears to be expanding at an accelerating rate. In the standard model of cosmology, dark energy currently accounts for almost three-quarters of the total mass-energy of the universe. Dark energy has been used as a crucial ingredient in a recent attempt to formulate a cyclic model for the universe. Two proposed forms for dark energy are the cosmological constant, a constant energy density filling space homogeneously, and scalar fields such as quintessence or moduli, dynamic fields whose energy density can vary in time and space. In fact, contributions from scalar fields that are constant in space are usually also included in the cosmological constant. The cosmological constant is thought to arise from the vacuum energy. Scalar fields which do change in space are hard to distinguish from a cosmological constant, because the change may be extremely slow. High-precision measurements of the expansion of the universe are required to understand how the speed of the expansion changes over time. The rate of expansion is parameterized by the cosmological equation of state. Measuring the equation of the state of dark energy is one of the biggest efforts in observational cosmology today. Adding the cosmological constant to cosmology's standard Friedmann-Robertson-Walker metric (FLRW metric) leads to the Lambda-CDM model, which has been referred to as the "standard model" of cosmology because of its precise agreement with observations. Strangely, dark energy causes expansion because it has strong negative pressure. A substance has positive pressure when it pushes outward on its surroundings. This is the usual situation for fluids. Negative pressure, or tension, exists when the substance instead pulls on its surroundings. A common example of negative pressure occurs when a solid is stretched to support a hanging weight. According to the Friedmann-Lemaître-Robertson-Walker metric, which is an application of General Relativity to cosmology, the pressure within a substance contributes to its gravitational attraction for other things just as its mass density does. Negative pressure causes a gravitational repulsion. The gravitational repulsive effect of dark energy's negative pressure is greater than the gravitational attraction caused by the energy itself. At the cosmological scale, it also overwhelms all other forms of gravitational attraction, resulting in the accelerating expansion of the universe. The pushing of positive pressure (and the pulling of negative pressure) are non-gravitational forces which just move substances around within space without changing space itself. But the gravitational attraction (or repulsion) they cause operates on space itself, decreasing (or increasing) the amount of space between things. It is this which determines the size of the universe. There is no necessity that these two effects should act in the same direction. In fact, they act in opposite directions. In 1998, observations of type Ia supernovae ("one-A") by the Supernova Cosmology Project at the Lawrence Berkeley National Laboratory and the High-z Supernova Search Team suggested that the expansion of the universe is accelerating. Since then, these observations have been corroborated by several independent sources. Measurements of the cosmic microwave background, gravitational lensing, and the large scale structure of the cosmos as well as improved measurements of supernovae have been consistent with the Lambda-CDM model. The type Ia supernovae provide the most direct evidence for dark energy. Measuring the scale factor at the time that light was emitted from an object is accomplished easily by measuring the redshift of the receding object. Finding the distance to an object is a more difficult problem, however. It is necessary to find standard candles: Objects for which the actual brightness, what astronomers call the absolute magnitude, is known, so that it is possible to relate the observed brightness, or apparent magnitude, to the distance. Without standard candles, it is impossible to measure the redshift-distance relation of Hubble's law. Type Ia supernovae are the best known standard candles for cosmological observation because they are very bright and thus visible across billions of light years. The consistency in absolute magnitude for type Ia supernovae is explained by the favored model of an old white dwarf star which gains mass from a companion star and grows until it reaches the precisely defined Chandrasekhar limit. At this mass, the white dwarf is unstable to thermonuclear runaway and explodes as a type Ia supernova with a characteristic brightness. The observed brightness of the supernovae are plotted against their redshifts, and this is used to measure the expansion history of the universe. These observations indicate that the expansion of the universe is not decelerating, which would be expected for a matter-dominated universe, but rather is mysteriously accelerating. These observations are explained by postulating a kind of energy with negative pressure: Dark energy. The existence of dark energy, in whatever form, is needed to reconcile the measured geometry of space with the total amount of matter in the universe. Measurements of the cosmic microwave background (CMB), most recently by the WMAP satellite, indicate that the universe is very close to flat. For the shape of the universe to be flat, the mass/energy density of the Universe must be equal to a certain critical density. 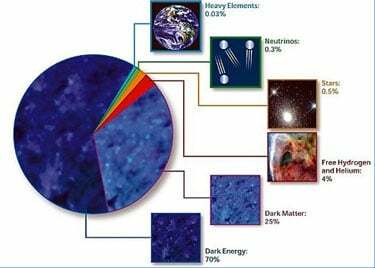 The total amount of matter in the Universe (including baryons and dark matter), as measured by the CMB, accounts for only about 30 percent of the critical density. This implies the existence of an additional form of energy to account for the remaining 70 percent. The theory of large scale structure, which governs the formation of structure in the universe (stars, quasars, galaxies and galaxy clusters), also suggests that the density of matter in the universe is only 30 percent of the critical density. The most recent WMAP observations are consistent with a Universe made up of 74 percent dark energy, 22 percent dark matter, and 4 percent ordinary matter. As this NASA chart indicates, roughly 70 percent or more of the universe consists of dark energy, about which we know next to nothing. The exact nature of this dark energy is a matter of speculation. It is known to be very homogeneous, not very dense and is not known to interact through any of the fundamental forces other than gravity. Since it is not very dense—roughly 10−29 grams per cubic centimeter—it is hard to imagine experiments to detect it in the laboratory. Dark energy can only have such a profound impact on the universe, making up 70 percent of all energy, because it uniformly fills otherwise empty space. The two leading models are quintessence and the cosmological constant. The simplest explanation for dark energy is that it is simply the "cost of having space:" That is, a volume of space has some intrinsic, fundamental energy. This is the cosmological constant, sometimes called Lambda (hence Lambda-CDM model) after the Greek letter Λ, the symbol used to mathematically represent this quantity. Since energy and mass are related by , Einstein's theory of general relativity predicts that it will have a gravitational effect. It is sometimes called a vacuum energy because it is the energy density of empty vacuum. In fact, most theories of particle physics predict vacuum fluctuations that would give the vacuum exactly this sort of energy. The cosmological constant is estimated by cosmologists to be on the order of 10−29g/cm³, or about 10−120 in reduced Planck units. The cosmological constant has negative pressure equal to its energy density and so causes the expansion of the universe to accelerate. The reason why a cosmological constant has negative pressure can be seen from classical thermodynamics; Energy must be lost from inside a container to do work on the container. A change in volume dV requires work done equal to a change of energy −p dV, where p is the pressure. But the amount of energy in a box of vacuum energy actually increases when the volume increases (dV is positive), because the energy is equal to ρV, where ρ (rho) is the energy density of the cosmological constant. Therefore, p is negative and, in fact, p = −ρ. A major outstanding problem is that most quantum field theories predict a huge cosmological constant from the energy of the quantum vacuum, up to 120 orders of magnitude too large. This would need to be canceled almost, but not exactly, by an equally large term of the opposite sign. Some supersymmetric theories require a cosmological constant that is exactly zero, which does not help. The present scientific consensus amounts to extrapolating the empirical evidence where it is relevant to predictions, and fine-tuning theories until a more elegant solution is found. Philosophically, the most elegant solution may be to say that if things were different, humans would not be around to observe anything—the anthropic principle. Technically, this amounts to checking theories against macroscopic observations. Unfortunately, as the known error margin in the constant predicts the fate of the universe more than its present state, many such "deeper" answers remain unknown. Another problem arises with inclusion of the cosmic constant in the standard model, which is appearance of solutions with regions of discontinuities (see classification of discontinuities for three examples) at low matter density. The discontinuity also affects the past sign of the vacuum energy, changing from the current negative pressure to attractive, as one looks back towards the early Universe. This finding should be considered a shortcoming of the standard model, but only when a term for vacuum energy is included. In spite of its problems, the cosmological constant is in many respects the most economical solution to the problem of cosmic acceleration. One number successfully explains a multitude of observations. Thus, the current standard model of cosmology, the Lambda-CDM model, includes the cosmological constant as an essential feature. Dark energy may become dark matter when buffeted by baryonic particles, thus leading to particle-like excitations in some type of dynamical field, referred to as quintessence. Quintessence differs from the cosmological constant in that it can vary in space and time. In order for it not to clump and form structure like matter, it must be very light so that it has a large Compton wavelength. No evidence of quintessence is yet available, but it has not been ruled out either. It generally predicts a slightly slower acceleration of the expansion of the universe than the cosmological constant. Some scientists think that the best evidence for quintessence would come from violations of Einstein's equivalence principle and variation of the fundamental constants in space or time. Scalar fields are predicted by the standard model and string theory, but an analogous problem to the cosmological constant problem (or the problem of constructing models of cosmic inflation) occurs: Renormalization theory predicts that scalar fields should acquire large masses. The cosmic coincidence problem asks why the cosmic acceleration began when it did. If cosmic acceleration began earlier in the universe, structures such as galaxies would never have had time to form and life, at least as it is known, would never have had a chance to exist. Proponents of the anthropic principle view this as support for their arguments. However, many models of quintessence have a so-called tracker behavior, which solves this problem. In these models, the quintessence field has a density which closely tracks (but is less than) the radiation density until matter-radiation equality, which triggers quintessence to start behaving as dark energy, eventually dominating the universe. This naturally sets the low energy scale of the dark energy. Some theorists think that dark energy and cosmic acceleration are a failure of general relativity on very large scales, larger than superclusters. It is a tremendous extrapolation to think that the law of gravity, which works so well in the solar system, should work without correction on the scale of the universe. Most attempts at modifying general relativity, however, have turned out to be either equivalent to theories of quintessence, or inconsistent with observations. Alternative ideas for dark energy have come from string theory, brane cosmology, and the holographic principle, but have not yet proved as compelling as quintessence and the cosmological constant. Yet another, "radically conservative" class of proposals aims to explain the observational data by a more refined use of established theories rather than through the introduction of dark energy, focusing, for example, on the gravitational effects of density inhomogeneities (assumed negligible in the standard Friedmann-Robertson-Walker approximation and confirmed negligible by studies of the anisotropies of the cosmic microwave background and statistics of large-scale structure) or on consequences of electroweak symmetry breaking in the early universe. Cosmologists estimate that the acceleration began roughly 9 billion years ago. Before that, it is thought that the expansion was decelerating, due to the attractive influence of dark matter and baryons. The density of dark matter in an expanding universe decreases more quickly than dark energy, and eventually the dark energy dominates. Specifically, when the volume of the universe doubles, the density of dark matter is halved but the density of dark energy is nearly unchanged (it is exactly constant in the case of a cosmological constant). If the acceleration continues indefinitely, the ultimate result will be that galaxies outside the local supercluster will move beyond the cosmic horizon: They will no longer be visible, because their line-of-sight velocity becomes greater than the speed of light. This is not a violation of special relativity, and the effect cannot be used to send a signal between them. (Actually there is no way to even define "relative speed" in a curved spacetime. Relative speed and velocity can only be meaningfully defined in flat spacetime or in sufficiently small, infinitesimal regions of curved spacetime). Rather, it prevents any communication between them and the objects pass out of contact. The night sky would remain the same however, to the naked eye. The Earth, the Milky Way, and the Virgo supercluster would remain virtually undisturbed while the rest of the universe recedes. In this scenario, the local supercluster would ultimately suffer heat death, just as was thought for the flat, matter-dominated universe, before measurements of cosmic acceleration. There are some very speculative ideas about the future of the universe. One suggests that phantom energy causes divergent expansion, which would imply that the effective force of dark energy continues growing until it dominates all other forces in the universe. Under this scenario, dark energy would ultimately tear apart all gravitationally bound structures, including galaxies and solar systems, and eventually overcome the electrical and nuclear forces to tear apart atoms themselves, ending the universe in a "Big Rip." On the other hand, dark energy might dissipate with time, or even become attractive. Such uncertainties leave open the possibility that gravity might yet rule the day and lead to a universe that contracts in on itself in a "Big Crunch." Some scenarios, such as the cyclic model suggest this could be the case. While these ideas are not supported by observations, they are not ruled out. Measurements of acceleration are crucial to determining the ultimate fate of the universe in big bang theory. Alan Guth proposed, in the 1970s, that a negative pressure field, similar in concept to dark energy, could drive cosmic inflation in the very early universe. Inflation postulates that some repulsive force, qualitatively similar to dark energy, resulted in an enormous and exponential expansion of the universe slightly after the Big Bang. Such expansion is an essential feature of most current models of the Big Bang. However, inflation must have occurred at a much higher energy density than the dark energy observed today and is thought to have completely ended when the universe was just a fraction of a second old. It is unclear what relation, if any, exists between dark energy and inflation. Even after inflationary models became accepted, the cosmological constant was thought to be irrelevant to the current universe. The term "dark energy" was coined by Michael Turner in 1998. By that time, the missing mass problem of big bang nucleosynthesis and large scale structure was established, and some cosmologists had started to theorize that there was an additional component to our universe. The first direct evidence for dark energy came from supernova observations of accelerated expansion, in Riess et al., and later confirmed in Perlmutter et al. This resulted in the Lambda-CDM model, which as of 2006, is consistent with a series of increasingly rigorous cosmological observations, the latest being the 2005 Supernova Legacy Survey. First results from the SNLS reveal that the average behavior (that is, equation of state) of dark energy behaves like Einstein's cosmological constant to a precision of 10 percent. Recent results from the Hubble Space Telescope Higher-Z Team indicate that dark energy has been present for at least 9 billion years and during the period preceding cosmic acceleration. ↑ P.J.E. Peebles and Bharat Ratra, The cosmological constant and dark energy, Reviews of Modern Physics, 75: 559–606. Retrieved December 1, 2007. ↑ L. Baum and P.H. Frampton, Turnaround in Cyclic Cosmology, Physical Review Letters, 98: 071301. Retrieved December 1, 2007. ↑ Sean Carroll, The cosmological constant, Living Reviews in Relativity, 4:1. Retrieved December 1, 2007. ↑ Saul Perlmutter, et al., Measurements of Omega and Lambda from 42 high redshift supernovae, Astrophysical J, 517:565–86. Retrieved December 1, 2007. ↑ D.N. Spergel, et al., Wilkinson Microwave Anisotropy Probe (WMAP) three year results: Implications for cosmology, NASA, Retrieved December 1, 2007. ↑ S. Weinberg, Anthropic bound on the cosmological constant, Phys. Rev. Lett, 59: 2607. ↑ A.M. Öztas and M.L. Smith, Elliptical Solutions to the Standard Cosmology Model with Realistic Values of Matter Density, International Journal of Theoretical Physics 45: 925-936. ↑ Kolb, Matarrese, Notari, and Riotto, Primordial inflation explains why the universe is accelerating today, lanl.arXiv.org. Retrieved December 1, 2007. ↑ Pierre Astier, et al., The Supernova legacy survey: Measurement of omega(m), omega(lambda) and W from the first year data set, Astronomy and Astrophysics, 447:31–48. Retrieved December 1, 2007. Carroll, Sean M. Why is the universe accelerating? Retrieved December 1, 2007. Conselice, Christopher J. 2007. The Universe's Invisible Hand. Scientific American. Harvard University. High-Z supernova search team. Harvard.edu. Retrieved December 1, 2007. The Katzman Automatic Imaging Telescope. The World's Most Successful Nearby Supernova Search Engine. Retrieved December 1, 2007. Peebles, Jim. Testing General Relativity on the Scales of Cosmology. Retrieved December 1, 2007. Perlmutter, et al. 1999. Paper confirming dark energy discovery. lanl.arXiv.org. Retrieved December 1, 2007. Riess, et al. 1998. Paper announcing the dark energy discovery. lanl.arXiv.org. Retrieved December 1, 2007. Supernova Acceleration Probe (SNAP). Home Page. Retrieved December 1, 2007. "Mysterious force's long presence". BBC News online. More evidence for dark energy being the cosmological constant. "Astronomy Picture of the Day" one of the images of the Cosmic Microwave Background which confirmed the presence of dark energy and dark matter. "Report of the Dark Energy Task Force". Wandelt, Ben. 2007. Changing Constants, Dark Energy and the Absorption of 21 cm Radiation. 2Physics.com. This page was last modified on 14 November 2017, at 00:13.